Larchmere Boulevard is ten blocks of upbeat vitality and offbeat charm containing unique shops, art and antique stores, restaurants and personal services. 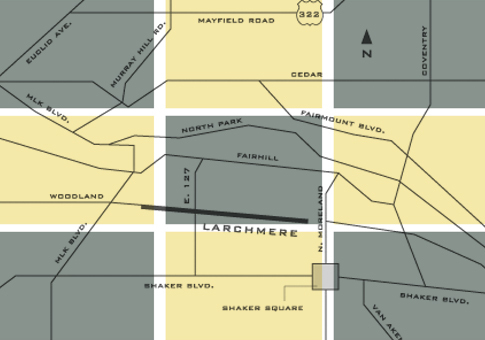 Located in what was originally an ethnic Cleveland neighborhood, Larchmere has evolved into a truly unique shopping destination - home to independent, locally-owned and locally-operated enterprises. The Larchmere district has embraced and enhanced the old-world charm of its buildings with more than 40 quirky shops and great service enterprises. You will have a truly one-of-a-kind shopping experience on Larchmere Boulevard. Yearly events like the Holiday Stroll, Larchmere Festival and the PorchFest, make Larchmere a fun entertainment destination. Inspired by the tagline “Upbeat Vitality, Offbeat Charm” and the funky, retro, shabby chic feel of Larchmere, local artist Tom Hubbard designed bike racks that are both usable and artistic. With a nod to the origins of the Larchmere as an art and antiques district, the bike racks are reminiscent of classic wooden chair styles: Shaker, Queen Anne, Bentwood, etc. Reinterpreted in both material and color, these functional and sculptural designs add interest and variety to the street. As part of the Cleveland public art program and the Larchmere streetscape project, a total of 25 bike racks are installed along a 12 block stretch. Public art is an important part of the Larchmere streetscape plan. Two murals have been installed on buildings that book-end the boulevard. The first was installed on the Life Skills building at 12201 Larchmere. It was designed by Ted Kurtz and created by Building Bridges Art Collaborative. The design features a middle ribbon of colorful watercolors of the district taken from photographs. The top and bottom of the mural features black and white drawings of the surrounding residential neighborhood – representing the area’s long and storied history. The second mural was installed on the Loganberry Books building at 13015 Larchmere Boulevard. It was designed by Gene Epstein, created by Morgan Litho, and installed with the help of artists Bill Hoose and Diana Petrauskas along with carpenters Eric Yeager and Brian Dronzak. A giant bookshelf, this mural celebrates literacy and community. Neighborhood residents made suggestions for the book titles.